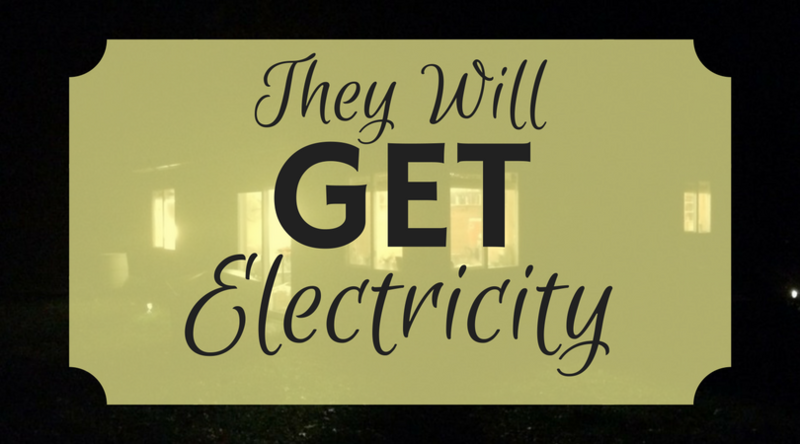 We’ve been asked two questions a lot: “How’s the electricity?” and “What’s changed now that you have electricity?”Before we got electricity, the winter darkness signaled bedtime and we went to bed a lot earlier than we normally would. These days, one of the things we’ve really enjoyed about the electricity is being able to stay up later, see what we’re doing, and feel less tired in the evenings. It’s amazing how much energy I get from having lights on in the house! It’s especially nice since it starts getting dark in the cabin about 3:30p.m. We’ve enjoyed it so much that for the first few weeks of having lights we stayed up way too late—we just couldn’t bring ourselves to shut them off! I still relish turning on the lights and watching a movie all the way through, but we have already gotten used to it in some ways. Last night, one light bulb was burnt out in the kitchen and Mark was convinced it was “so dark in here.” We love our light and it has made living here so much easier and better overall. With this step in the direction of modern times I feel as though so many burdens have been relieved. Daylight no longer schedules my days. Before, I needed to complete certain tasks prior to sundown because there wouldn’t be adequate light to see by later. I had to ration my use of electronics and be very diligent with battery life or I’d go without until we next ran the generator or were going to a place where I could charge my devices. It was a constant balancing act with the limited resource and though it can be done, it was tiring to keep up day after day. 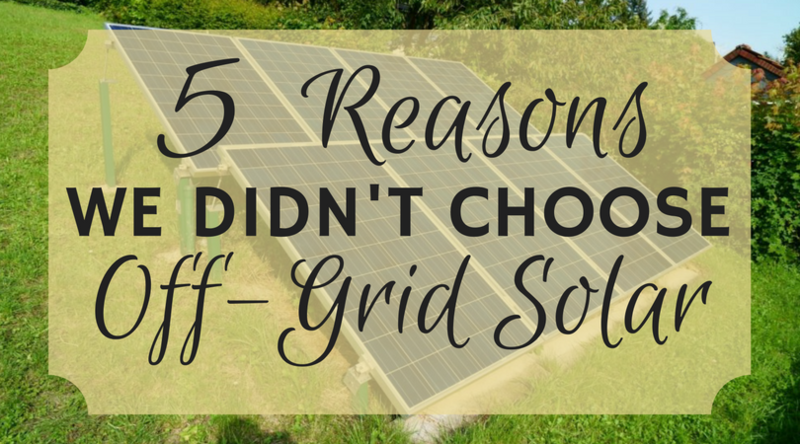 Not having electricity forced me to make many more decisions with my time and task priorities. 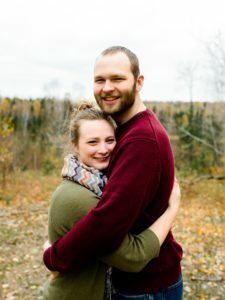 I didn’t realize until after the fact how much head space I used up, decision making I had to do, and mental energy I spent every day in order for us to live here. Before getting electricity, one of the biggest mental burdens was managing food. It might’ve been the biggest drain on my mental resources, now that I think about it. 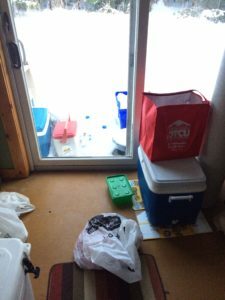 When we moved here in December last year, it was easy to keep things refrigerated—just open the door and either put the food directly into a snow bank or put a cooler full of food into the snow bank. It was easy to keep things frozen, so easy, in fact, that it became a problem. Every night throughout the winter we’d check the forecast for evening temperatures and debate whether we should risk leaving our cooler out all night (and possibly freezing our eggs, milk, etc.) or bringing the cooler inside (where it might get too warm and go bad). Often, it worked out fine to bring the cooler in almost every night, but it was a gamble and we did resort to a lot of close inspection and “sniff testing” before cooking or eating. We would also gamble by leaving the cooler out overnight and I did cook with partially frozen pancake batter on one occasion. It’s all part of the adventure, right?! This is what I would tell myself, anyway, when the milk either froze or went bad. Side note: almond milk is quite resilient to temperature changes, which is to say, that it never looked bad, smelled bad, or made us ill after being repeatedly warmed and cooled. I will admit that I frequently worried about our food making us ill because it wasn’t stored properly, but, praise the Lord, we haven’t had any issues so far. Blue cooler in the sauna…see the milk on the floor? Then came summer and food management took on a whole other dimension: how on earth do we keep our food chilled? Looking back, I’m certain we could have done something to make this easier on ourselves but at the time we didn’t know how long it would take to get electricity. We thought we would get it early summer, maybe even in May; instead, we got it the end of September. 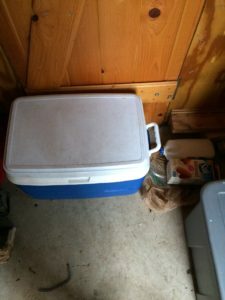 So all spring and summer, we kept a blue cooler in our sauna building (out of the sun and on a cool concrete slab). An ice block would last about three days and a bag of ice cubes lasted only one. The size of the cooler limited how much food I could buy and still fit the ice so, between the two, I was at the grocery store every other day, if not every day. For a time we used a borrowed Yeti cooler and it was awesome. It was big and kept food colder much longer than our blue cooler. It was great while it lasted but the family we borrowed it from needed it back because their own fridge quite working. Completely empathizing with how hard it can be to be without a fridge for an extended period of time, we unloaded our stuff, threw away a lot of it, condensed what we could, and moved the rest into our blue cooler which has remained our “fridge” for the brunt of our time here. With the blue cooler, I didn’t have the space to hold a week’s worth of meal ingredients. 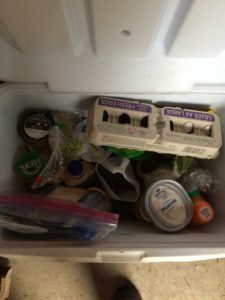 I could only buy what would fit in the cooler or in some cases I would buy too much and I’d have to completely empty the cooler, pick and choose what was most important to stay and what could go, and then repack it as tightly as possible, making sure that the eggs wouldn’t get crushed when I forced the lid closed. Items that didn’t make the cut were usually things like chili sauce, jelly, pickles, pesto, dressing, and mustard— basically, condiments. Instead of buying another better cooler we simply asked ourselves questions like: “Does this need to be refrigerated? I know we usually keep it in a fridge but does it need to live there?” “Do we really need dressing? Will I eat a salad without dressing?” (Nope!) The validity of every food item was questioned and weighed against its fellows. Leftovers were also rejected a lot, less because they were leftovers and more because they were kept in rigid containers that didn’t utilize space and made it difficult to tetris all our food together. Thankfully, Mark could just take those to work and keep them in the fridge there. Are you getting a picture of how much went into maintaining food? I will now pull out my favorite Minnesota expression: OOFTAH! You can understand how I became utterly sick of the grocery store, to say the least. I am the type of person who enjoys staying home and who enjoys buying in bulk in order to do so, but this year my cabin and cooler conspired against me to disrupt that lifestyle. Most days I was okay with it (the knowledge that something is temporary does wonders to your endurance and perseverance), but other days I would have a minor breakdown over having to go to the grocery store again. I will say this though: if it wasn’t for grocery stores we would’ve had a much harder time living without a refrigerator. It was like the grocery store was our refrigerator and if we wanted something frozen or even cold we had to go all the way there to get it instead of just walking through the house. Though I may have consistently seen it as a curse, the access to grocery stores was truly a blessing. 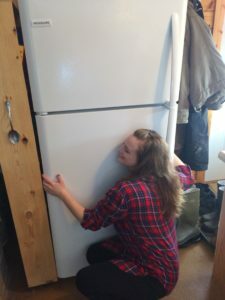 You can imagine how excited getting electricity made me because in my mind it meant: we can now get a refrigerator! And I think that has been the crowning achievement of all our summer and fall efforts to put in electricity. 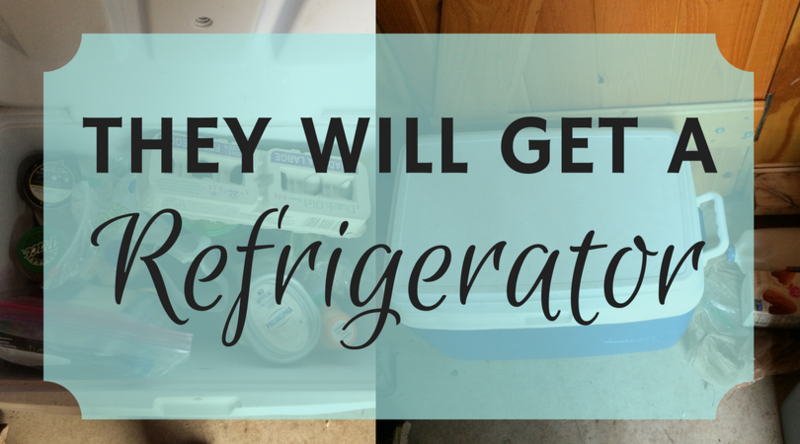 I experienced a huge surge of relief when our new refrigerator was delivered and installed. It was better than all my childhood Christmases! You want to guess what the best part was? No, it wasn’t that I could buy bulk frozen food again (hallelujah! ), or over a week’s worth of meal ingredients (glory! ), or having to spend less time thinking about food (praise God!). The best part was my first trip to the grocery store knowing that I had a fridge at home. I was a kid in a candy store! I texted Mark when I arrived: “I’m at the grocery store and I’m going to use the BIG CART! I’m so excited!” And I was. That might have been the most expensive grocery store trip to date and I’m still happy about it. Oh, frozen veggies, how I’ve missed you! It wasn’t all easy-breezy with our new fridge, though. From the first day we had it we could hear a high pitched humming. It drove Mark crazy! I, on the other hand, was so relieved by having the fridge that I couldn’t bring myself to become even slightly irritated about it. I was fully prepared to endure the ringing to have the fridge. Mark wasn’t so taken but, thankfully, the noise stopped after a couple weeks. Whew! These days, the blue cooler is lying abandoned in the yard and I buy groceries once a week and love it. I love that everything I want to eat is right there in the house, that my beans don’t go bad (a story for another day), and how much more mental energy I have because I didn’t spend it maintaining food. All in all, life as gotten so much easier at the cabin and I am so thankful for the change. They aren’t called “modern conveniences” for nothing!